Two mirrors one infront of the other + postcards. A neon work with light-writing that reads "I Revolt, Therefore We Are" - after a phrase Albert Camus coined in his 1951 essay L'homme revolté - is a way for the artist to express the need for solidarity. In the same vein, we can also interpret Bellantoni's two mirrors facing each other as the same shock of being as the shock of being-with (Jean-Luc Nancy), a plural singularity, a nos sumus (eng: we are), wanting to 'forget by heart' the history of the place in order to take care of it. Elena Bellantoni lives and works between Berlin and Rome. She graduated at "La Sapienza" in Contemporary Art and studied in Paris and London , where in 2007 he received an MA in Visual Art WCA University of the Arts London . In 2007 she creates Platform Translation Group; in 2008 she is co-founder of 91mQ art project space in Berlin. In 2006 she won the prize Temphelhof - Shoneberg Kunstpreis Zum Ball- Spiel in Berlin ; 2009 she won the Movin'up of G.A.I. Turin with a project in Santiago the Chile ; 2012 she won the NGBK call with In Other Words realized at Kunstraum Kreuzberg Bethanien in Berlin. In 2013 she won the first award at FestArte / Factory Colors of the World at the Macro Pelanda Museum Rome. 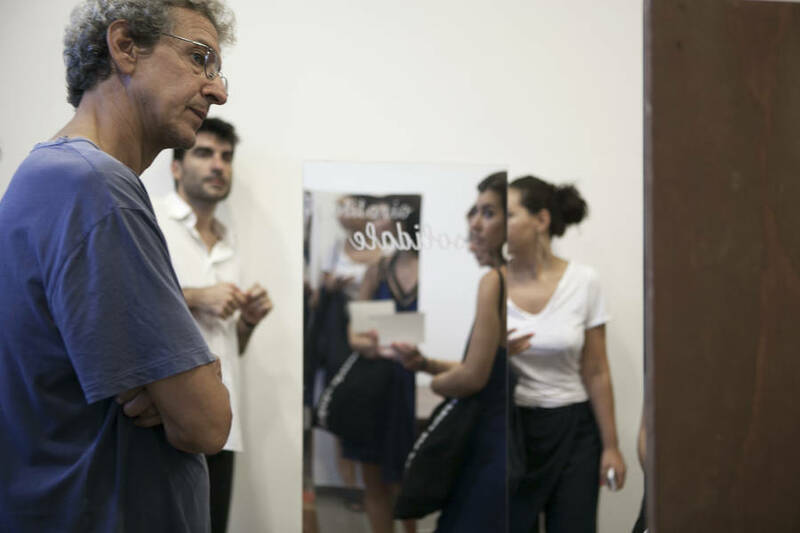 Residences : 98weeks project space with Francis Alys in Beirut in 2008, Residencia Expacio Versus in Santiago, Chile in 2013; Progetto Isole in Palermo in 2009. In 2014: she participated at African Fabbers with a workshop and an exhibition during the Marrakech Biennale; she is artist in residency at Careof DOCVA in Milan; selected for the Video Art Year Book, Bologna. Among the SOLO shows: 2015: Hala Yella at the end of the world, Set Up Plus Art Fair / Alviani Art Space; Passo a Due, Careof DOCVA, Milano; 2014: Fondazione Filiberto Menna al Museo Archelogico di Salerno Tempo Imperfetto, Salerno. 2013: My name is... elena bellantoni (.BOX) videoart project space , Milano. 2012 Looking for E.B., Galleria Muratcentoventidue, Bari. 2012: Hala Yella presentation, Caja Negra, Santiago de Chile. 2008: Is it Real? 91mQ art project space, Berlin. 2007: Transparentz, Weisser Elephant Galerie, Berlin. Nation 25, Magazzini del Sale, 56th Biennale di Venezia, Venezia; Exploring Resilience, Mila Kunstgalerie, Berlino. 2014: Farnesina porte aperte mostra artisti MAE nuove acquisizioni, Ministero degli Affari Esteri alla Farnesina, Roma. Talent Prize 2014 mostra finalisti Acquario Romano, Roma. White Canvas, University of Oradea, Faculty of Arts, Romania. Video Art Year Book at Bologna Universty of Visual Arts, Bologna. African Fabbers, Marrakech Biennale, L'Blassa, Marrakech, Marocco. Exodus Centro Cultural Recoleta, Buenos Aires, Argentina. Spazi di percezione tra intangibile e tangibile, Galleria Nazionale d'Arte Moderna, Roma. 2013: 55th Biennale di Venezia, presentazione project Italiens, Ca' Giustinian, Venezia. Ikono Video Festival in streaming: Visioni Domestiche, Collegium Hungaricum, Berlino; Archive tellers, MAXXI B.A.S.E., Roma; Visioni d'arte Galleria A+A, Venezia; C'è una piccola radice che, se la masticate, vi spuntano le ali immediatamente, MAC Museo, Lissone; Exodus Italia, MUMI Museo de las Migraciones, Montevideo Uruguay.